Conversations make or break everything in sales. Every conversation you have is an opportunity to find new prospects, win new customers, and increase sales. Rainmaking Conversations provides a proven system for leading masterful conversations that fill the pipeline, secure new deals, and maximize the potential of your account. 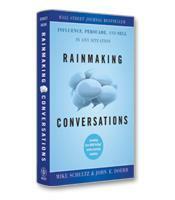 Rainmaking Conversations offers a research-based, field-tested, and practical selling approach that will help you master the art of the sales conversation. How to build rapport and trust with potential clients from the first contact. How to uncover the full set of prospect and customer needs. How to see the real need behind client challenges. How to understand and communicate your value proposition. How the Five Whys can help you find the underlying cause of a problem. How to overcome all types of objections and move toward the close.